High Performance Computing (HPC), Data Analytics (DA), and Deep Learning (DL) applications offer leading edge capabilities to researchers and scientists, but these users don’t always have the higher-level knowledge or the bandwidth required to configure a cluster to run them. Cluster administrators are often needed to deliver and maintain complex hardware and software environments in order to support HPC/DA/DL applications. Cloud computing offers one point of entry for these applications as it eliminates the need to set up actual hardware, but cloud vendors typically only go so far in terms of resource capabilities (i.e., getting your applications to run is still your job). Users and administrators are still tasked with the problems of final configuration and handling support issues. In light of this, XTREME-D developed XTREME-DNA to keep the user out of the cluster management business. Using a web-based interface, users can build HPC/DA/DL clusters in both private and public clouds in as little as 10 minutes. 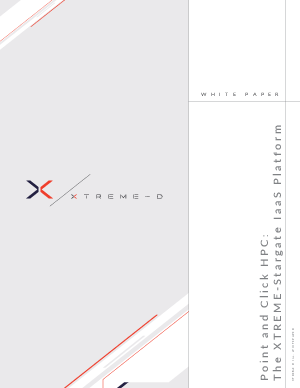 XTREME-D’s next step in offering seamless HPC/DA/DL computing is the XTREME-Stargate gateway platform, or cluster portal. This on-prem device acts as a cluster “head node” and provides secure and fast access to bare-metal clusters that are configured using enhanced XTREME-DNA technology.